Pastry chef and consultant Daniel Fletcher provides his easy recipe for this glamorous deconstructed cheesecake dessert. Although there are several elements, including an oat crumble, passion fruit curd and exotic sorbet, they are all simple to make and can be made in advance. Although I originally designed this dessert for the Michelin-starred Angler restaurant, this dish can be created at home and is a good base for a cheesecake which can be made in minutes. You can finish it in any way you like – experiment with different flavours and see which one works for you. 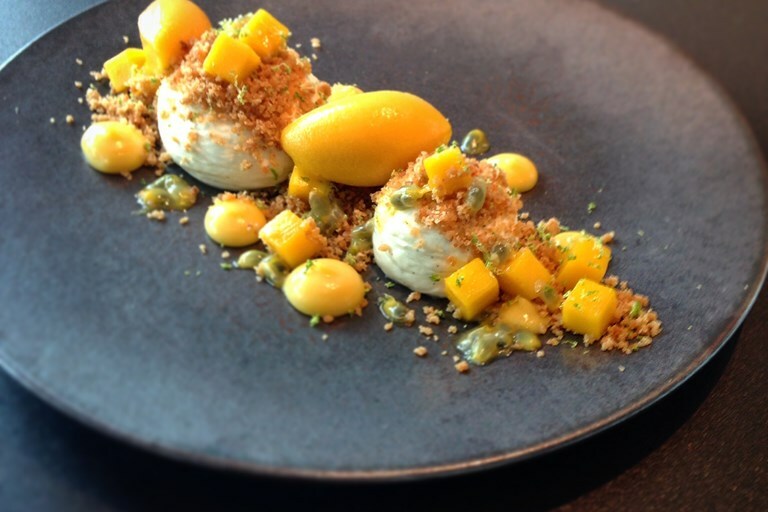 Cheesecake can be quite a rich heavy dish so it is nice to be able to balance that against the clean flavours of mango and the sharpness of the passionfruit which brings and almost cleansing quality to the dish. Balance in any dessert that I create is important. There are no real key techniques to this dish as it is quite straightforward, but as with all my recipes you must have patience; pastry cannot be rushed. There are no shortcuts and you must be methodical in your approach and ensure you follow the recipe.